Szechuan, Hunan & Cantonese styles blend traditional culinary art with the modern concept of fine dining in an elegant contemporary atmosphere. Experience our distinctive menu featuring more than 80 traditional Chinese favorites, and unique specialties from across Asia. We use only the freshest, most natural ingredients. We also offer create- your-own dishes with something that is sure to please your appetite. Come and enjoy our cozy dining room and friendly service. 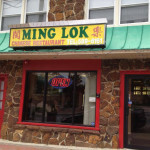 Thank you for dining at Ming Lok Chinese Restaurant. We welcome any suggestions you may offer so that we may better serve you.